Grado offers a mini adapter cable that converts a ¼ inch (6.3 mm) plug to a 1/8-inch (3.5 mm) plug. 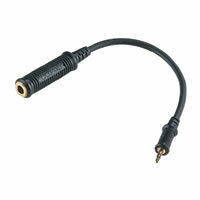 The mini adapter cable has a 1/8 inch (3.5 mm) plug then eight inches of cable connected to a ¼ inch (6.33 mm) jack. The eight inches of cable eliminates added leverage on the output circuit board of the source. The mini adapter cable is constructed of the same high quality wire as Grado's headphone cable.